The city’s Jardim Zoológico proposes a family-friendly way to spend the public holiday weekend in Rio, with a three day-long food festival. RIO DE JANEIRO, BRAZIL – Taking place for the first time, Rio’s Jardim Zoológico will hold a food truck festival over the three-day holiday weekend. Starting from tomorrow, Saturday April 29th, and continuing until the evening of Monday, May 1st, the event promises to be a family-friendly way to spend the public holiday. 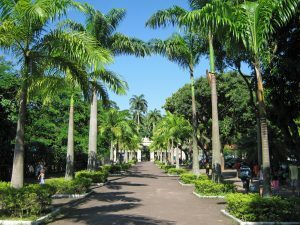 Rio’s Jardim Zoologico will host its first ever food festival this weekend, photo by Halley Pacheco de Oliveira. The food festival will gather approximately thirty artisanal food trucks and craft brewers over the three days, in addition to offering a variety of free children’s activities, a raffle and discounts for activities at the Jardim Zoológico. Participating food trucks offer a variety of options for visitors. For those in search of burgers, popular Rio chain Hell’s Burger will be present, along with US-inspired burger truck Big Daddy’s. There will also be European flavours on offer, from Leblon-based Al Taglio to German restaurant Kabana Do Alemão. Latin American flavors will be on offer from Las Empanadas, Infarinata and Kariteria Karioca. Meanwhile those with a sweet tooth will find comfort in Quero Churros, Happy Sorvetes and Birgadeiro Aconchego. There will also be a range of craft beers available for adults at the event. Rio favourites Colorado, Invicta, Lhama Loca and Niterói-based Noi will all be present, along with Barril Beer Truck, Capa Preta and Cevadas. Creating a chilled out atmosphere at the event, DJs Karla Gasparini, Gui Andrade, Leo Simões and Ney will play ambient tracks at the Jardim Zoológico throughout the weekend. Entry to the event is free over the three days, and on Saturday, April 29th, there will be a special program with free musical activities for children visiting the zoo from 11AM. Led by Panos Pra Manga, from channel GNT’s ‘Fazendo a Festa’ program, children will be able to participate in singing and musical activities, painting and storytelling. Families who visit the event will automatically be entered into a competition to win tickets to the Unicirco Marcos Frota, which hosts entertainment events in the picturesque Parque Municipal da Quinta da Boa Vista.